Imaginative realism, as the cutting edge of contemporary realist painting, combines classical painting technique with postmodern narrative subjects, focusing on the unreal, the unseen, and the impossible, offering visions of humanity’s mythic past, its unexplored future and, in some cases, its terrifying present. 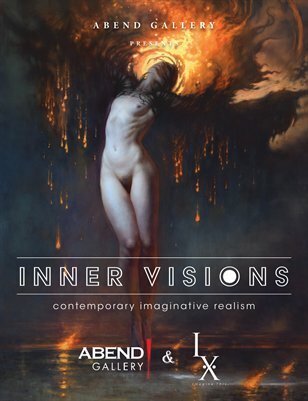 Inner Visions brings together over 70 artists covering the gamut of contemporary imaginative realism, showcasing the remarkable diversity of work being created under its banner. The show includes upcoming young artists side by side with award-winning, world renowned painters with multiple monographs dedicated to their work. Their work hangs everywhere from galleries and museums to major private and corporate collections. A show curated by Patrick and Jeannie Wilshire, Directors of IX Arts. Hosted by Abend Gallery.